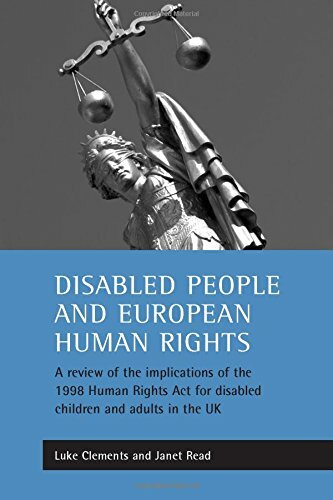 [PDF] Disabled people and European human rights: A review of the implications of the 1998 Human Rights Act for disabled children and adults in the UK | Free eBooks Download - EBOOKEE! Description: Over the past two decades, there has been increasing recognition of the ways in which disabled children and adults have been denied human and civil rights that others take for granted. In the year 2000, the Human Rights Act 1998 came into force in the United Kingdom. This book reviews the implications of the Act for disabled people. The book provides a clear and accessible account of the potential of the Human Rights Act to make a positive difference in relation to issues that have been identified through research, policy development and political debate as significant in the lives of disabled people. No comments for "[PDF] Disabled people and European human rights: A review of the implications of the 1998 Human Rights Act for disabled children and adults in the UK".